Most overseas visitors think of South Africa as a land drenched in perpetual sunshine. However, with a total landmass of over 470,900 square miles, South Africa's weather is not so easily summarized. It is a land of arid desert and lush tropical coasts, of temperate woodland and snow-capped mountains. Depending on when you travel and where you go, it is possible to encounter almost every different kind of weather extreme. Although generalizing South Africa's weather is difficult, there are a few absolutes that apply throughout the country. Unlike Africa's equatorial countries, where the year is split into rainy and dry seasons, South Africa does have four seasons—summer, fall, winter, and spring—only they are flipped from the seasons in the Northern Hemisphere. Summer lasts from December to February, and fall stretches about March through May before winter takes over from June to August, while spring brings blooms in many places during September and October. For most of the country, the rains usually coincide with the summer months, although the Western Cape (including Cape Town) is an exception to this rule. Parts of South Africa see summer highs get up to 81 degrees Fahrenheit (28 degrees Celsius), with averages closer to 77 degrees Fahrenheit (25 degrees Celsius), while the mild winters produce average highs of approximately 63 degrees Fahrenheit (17 degrees Celsius). Of course, these averages change dramatically from region to region. Generally speaking, temperatures at the coast are more consistent throughout the year, while the arid and mountainous areas of the interior see the greatest fluctuation in seasonal temperatures. Regardless of when or where you travel in South Africa, it's a good idea to pack for all occasions. Even in the Kalahari Desert, nighttime temperatures can drop below freezing. Located in the far south of the country in the Western Cape, Cape Town has a temperate climate similar to that of Europe or North America. Summers are warm and generally dry, and at times the city has been plagued by drought. Winters in Cape Town can be downright cold, and the majority of the city's rain falls at this time. The shoulder seasons are often the most pleasant. Thanks to the existence of the cold Benguela current, the waters around Cape Town are always chilly. The climate for most of the Garden Route is similar to that of Cape Town. Situated in the northeast province of KwaZulu-Natal, Durban enjoys a tropical climate and weather that remains fairly warm all year round. In the summer, temperatures can be sweltering, and the humidity level is high. The rains come with the higher temperatures, and usually take the form of short, sharp thunderstorms in the late afternoon. Winters are mild, sunn, and typically dry. Again, the most pleasant time of year to visit is usually in spring or fall. The Indian Ocean washes Durban's shores. The sea is positively warm in summer and refreshingly cool in winter. Johannesburg is located in Gauteng province in the northern interior. Summers here are generally very warm and humid and coincide with the rainy season. Like Durban, Johannesburg sees its fair share of spectacular thunderstorms. Winters in Johannesburg are moderate, with dry, sunny days and chilly nights. While Kruger National Park offers safari opportunities year-round, many prefer the dry, mild winter months to the wetter summer months. Like Durban, the Drakensberg Mountains are located in KwaZulu-Natal. However, their increased elevation means that even in the height of summer, they offer a respite from the hot temperatures of the coast. Rainfall can be significant here during the summer months, but for the most part, the thunderstorms are interspersed with perfect weather. Winters are dry and warm during the day, although nights are often freezing at higher elevations and snow is common. April and May are the best months for trekking in the Drakensberg. The Karoo is a vast region of semi-desert wilderness that covers some 154,440 square miles square kilometers and spans three provinces in the center of South Africa. Summers in the Karoo are hot, and the region's limited annual rainfall occurs at this time. Around the lower Orange River area, temperatures frequently exceed 104 degrees Fahrenheit (40 degrees Celsius). In winter, the weather in the Karoo is dry and mild. The best time to visit is between May and September when the days are warm and sunny. However, be aware that nighttime temperatures can drop dramatically, so you'll need to pack extra layers. Spring is an extremely pleasant time to visit South Africa. Starting in September, temperatures usually climb above 60 degrees Fahrenheit (16 degrees Celsius) in Cape Town and to almost 80 degrees Fahrenheit (27 degrees Celsius) in Pretoria. Temperatures continue to rise over the season, as rains decrease, making this a great season to explore the country. What to pack: Your packing list for fall should include some of the lighter clothing you'd pack for summer, as well as a jacket or sweater for the occasional chilly day. Don't forget sunscreen—the sun in South Africa is harsh year-round. The summer months in South Africa bring about hot, tropical weather throughout much of the country, making for great getaways in December, January, and February. In the western part of South Africa, afternoon rain showers are frequent. Cape Town is also quite windy at this time. Water temperatures are warm and ideal for swimming. What to pack: During these months, pack clothes that are cool, lightweight and comfortable, as temperatures can be scorching. Pack swimwear if you'll be visiting the beach. March is typically the last warm month in South Africa, with a daytime temperature ranging from 77 to 82 degrees Fahrenheit (25 to 28 degrees Celsius). In April, temperatures drop slightly more, and fog usually occurs. In May, there are showers and heavy clouds. 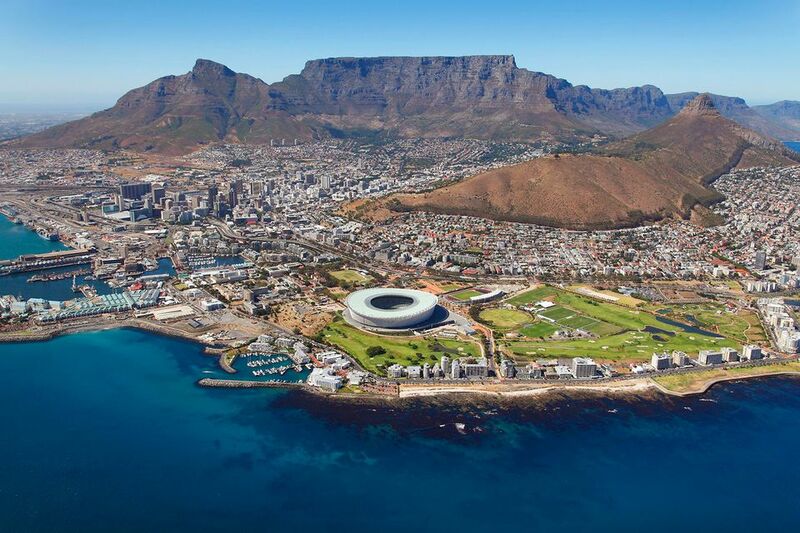 Temperatures in Cape Town typically hover around 65 degrees Fahrenheit, while Johannesburg is usually above 70 degrees Fahrenheit (21 degrees Celsius). What to Pack: Pack light, breathable clothing, but be prepared for rain too. Don't forget insect repellant, preferably with DEET. Winter in South Africa brings about unpredictable weather from June through August that can vary wildly depending on where you're visiting. For example, Cape Town might dip to 47 degrees Fahrenheit (8 degrees Celsius) in July while it's 72 degrees Fahrenheit (22 degrees Celsius) in Durban. Snow is common in the mountains. If you're hoping to see whales, this is the best time to do so. What to Pack: This time of year in South Africa is typically usually mild, but you should still pack long-sleeved shirts, sweaters, a jacket, and a good raincoat, especially if you're visiting wetter coastal cities.